Introduction Since the NICE guidelines in 2004 and introduction of the Quality and Outcomes Framework (QOF) in 2004, the prevalence of COPD seen in general practice has increased (Smith 2008).1 We have investigated whether this trend has continued until 2009, and explored whether this can be explained by change in mean age at diagnosis and death. Methods We identified all patients aged between 35 and 89 years (n=2 173 494, mean age =56, 49% male) in The Health Improvement Network (THIN) primary care database. From this cohort of patients we identified patients with a diagnosis of COPD using the criteria for QOF. We calculated annual incidence and prevalence rates, and mean age of patients with COPD, first COPD diagnosis and death between 2000 and 2009. Results In total, 53 379 (2.5%) of the patients were diagnosed with COPD. The prevalence of COPD increased by 50% over the 10-year period, from 24 cases per 1000 patient years in 2000 to 36 in 2009 (Abstract P213 figure 1A). However, the diagnosis of new COPD cases remained fairly constant (p=0.295), at 3.5 cases per 1000 patient years (Abstract P213 figure 1A). The mean age at first COPD diagnosis (incidence) decreased significantly (p<0.001) by 2 years and 5 months from 69 years and 1 months in 2000 to 66 years and 8 months in 2009 (Abstract P213 figure 1B). The mean age at death of COPD patients increased significantly (p=0.008) by 9 months from 76 years and 2 months in 2000 to 76 years and 11 months in 2009 (Abstract P213 figure 1B). 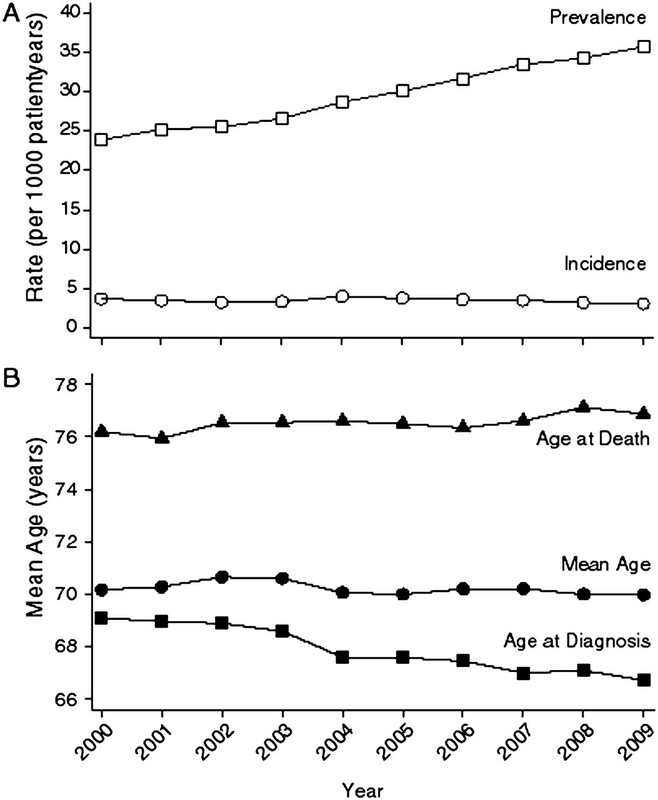 Whereas the mean age of prevalent patients remained fairly constant (p=0.098) over the period, varying between 70 years and 70 years and 8 months (Abstract P213 figure 1B). Conclusion We found that over the last decade, the average age of patients with COPD has remained relatively constant at around 70 years. COPD is increasingly being diagnosed at a younger age and patients are living longer, which may in part explain the 50% rise in COPD prevalence.